Turtle Beach Corp is likely to experience declining growth in the next two years, with a stagnant revenue trend in the long-term. Management's guidance for FY19 is exceedingly optimistic as their assumptions on replacement cycles for incremental users are unrealistic. As the 'Battle Royale' craze fades, the active player base for this genre of games is likely to stabilize or decline moderately, consistent with past trends of popular game formats. The new normal will see HEAR's long-term sales driven by the console installed base and competitive dynamics in the PC peripherals industry, which implies a bleak outlook. With large insider selling, an expensive valuation multiple and mediocre long-term prospects, investors should avoid HEAR. Turtle Beach (HEAR) is a gaming accessories maker focusing primarily on producing console headsets for the market in North America and Europe. The company recently acquired ROCCAT, a small brand of PC gaming accessories with a presence in Europe and East Asia, and plans to grow their limited share in the PC market. Traditionally, HEAR has derived nearly all its revenue from the console gaming market, with a wide range of headsets ranging from sub-$50 to over $300 price points. Whilst latest data from NPD indicate a market share of 46% for North American console gaming headsets, their share of the PC accessories space is largely insignificant. Beginning in 2Q'18, HEAR experienced a surge in headset sales due to the frenetic popularity of 'Battle Royal' format games, including titles such as PUBG, Fortnite and H1Z1. Uniquely, the nature of these games meant that higher-end headphones dramatically enhanced player experience by improving the awareness of in-game surroundings and facilitating better teamwork, thus driving significant demand for Turtle Beach headsets. 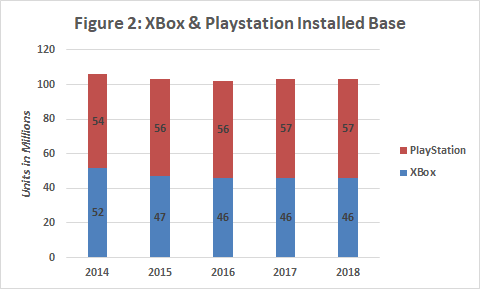 As the player base for these games and the BR format grew exponentially, attach rates of headsets to gaming consoles (primarily Xbox and PS3/4) skyrocketed, leading to a surge in revenue which peaked in FY18'Q4. Shortly after peak sales in last year's holiday season, management became more measured in FY19 guidance as they expect normalization in the revenue trend, with the majority of future sales to come from the replacement cycle demand from an enlarged base of existing users compared to the sky-high growth observed last year when the BR-craze first took hold. This news, along with the ROCCAT acquisition that looked to drive costs higher, led to a capitulation in HEAR's share price immediately after the Q4 earnings call. Despite losing a third of its market cap in the past month, I believe the worst is not over for HEAR. The company remains grossly overvalued relative to normalizing fundamentals as the BR-craze passes. Whilst BR games and the format itself is not a complete fad, a reasonable base case should assume the growth of active players taper out, and trend towards a stable player base in the long-term. Bulls seem far too optimistic regarding HEAR's growth prospects, particular since the surge in demand was not secular, but incidental in nature. Moreover, the market seems to be overlooking the fact that HEAR operates in a highly competitive market with historically thin margins and low returns. This is particularly important given their entry into the cutthroat PC gaming accessories market, where they are highly disadvantaged against far more established brands like Razer, Logitech, Steelseries and others. As profitability normalizes in the next year and expenses rising due to the ROCCAT acquisition, earnings are likely to be disappointing. 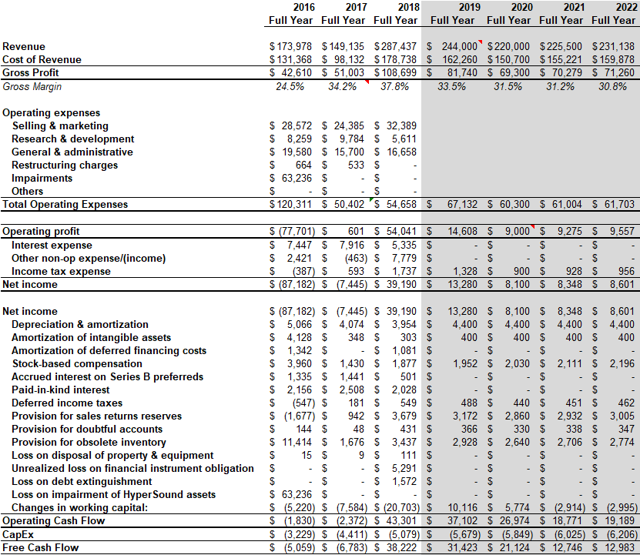 Given these poor fundamentals, HEAR is grossly overvalued at ~13 times FY2019 earnings, assuming management's guidance materializes. I believe the market is over-estimating future revenue growth, as low single-digit or even negative top-line growth is likely. A key tenet of the bull case rests on the assumption that the growth we've witnessed in FY2018 is likely to be sustained into the future, and marks the start of a positive secular trend. Generally, bulls tend to cite the increase in consumer spending of gaming accessories and "premiumization" of these products with more high-end brands hitting the market. On this basis, they push a narrative of secular growth surrounding HEAR's headsets. However, this view does not square with empirical evidence, particularly when we examine pre-FY2018 sales trends and the key drivers of HEAR's revenue. Moreover, I posit that the majority of this growth occurs in PC gaming, not console gaming, and therefore has a negligible effect on HEAR's core business. A key observation to note is that HEAR's top-line growth was stagnant and experienced volatile declines prior to FY18. The rising popularity of gaming and spending on accessories in general is not a new trend, but HEAR derived little to no benefit from this before the BR craze hit in FY18 (Figure 1). Management implied in their Q4 earnings call that lackluster sales from FY15 - FY17 was due to channel inventory adjustments, but this explanation is not accurate for two reasons. First, a key reason for excess inventory cited since 2013 was the disruption caused by Xbox One and PS4 not being compatible with the older generation of headsets. However, this effect had decreased over the next 3 years, and was largely insignificant by FY16, as mentioned in HEAR's 10K report that year. The fact that FY17 quarterly sales were extremely low relative to prior years, despite the disappearance of the drag from older-gen headsets, indicates an absence of growth. Second, sell-through data from NPD from FY15 - FY17 shows confirms the view that growth was lackluster (see below), as retail sell-through excludes the impact of excess inventory. Therefore, even when we account for inventory issues, it is clear that the root cause of HEAR's stagnant top-line was simply that demand for console headsets were stale. 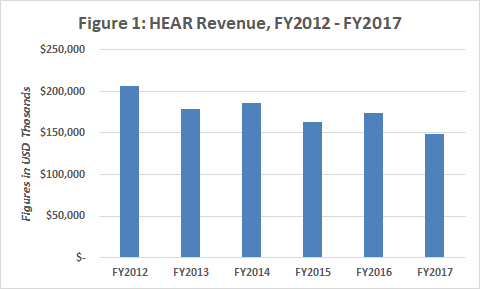 To diagnose why there was a lack of growth prior to FY18, we drill down to the drivers of HEAR's revenue. HEAR specifically operates in the console headsets market, where it typically derived over 95% of its revenue (pre-ROCCAT acquisition). As such, their revenue growth is driven far more by specific factors like console installed base growth, game release cycles, and retail channel inventory, instead of a general "gaming popularity" trend. An important distinction is that any rise in spending on PC-gaming accessories is unlikely to benefit HEAR's core business, as they are largely distinct markets. Examining these drivers, note that the global console installed base has been largely stagnant since 2014 (Figure 2), having already achieved high penetration rates in a very mature market equilibrium. Assuming headset attach rates per console is stable, this would result in stagnant headset sales, consistent with HEAR's revenue trend in the same years. It was only the release of the BR game format that catalyzed growth for HEAR, which dispels the notion of a "secular trend" existing prior to the structural break of the revenue trend in FY18. However, this dramatic growth is not likely to be sustained as the BR-craze fades. Admittedly, investors may have reasonable disagreements to this view, but I would forward an argument on why the likelihood of sustained growth is very low. The history of new games and formats tells us that player bases for a particular genre/game are likely to stabilize once it has received widespread penetration. This harkens back to the time when World of Warcraft was first released, or when MOBA games like Starcraft and DOTA became popular. Over time, player numbers show a remarkably similar trend of exponential rise, before peaking and proceeding to decline at a moderate pace as gamers' preferences shifted to the next upcoming trend. This means that the player base for BR games is likely to either become stable or decline moderately. Moreover, the very large player base right now (with Fortnite alone having 250 million registered players) means it is in the process of peaking. Crucially, HEAR management themselves are guiding to a far lower sales figure for FY19, which indicates that they hold a similar view. Specifically, they stated on the Q4 call that the major driver of revenue going forward is the replacement cycle from a larger installed base of headset users, compared to incremental growth in new headset users. Stripping out the effect of 8-months of ROCCAT revenue from the $240-$248mn headline revenue figure for FY19, console headset sales are projected to be only $218-222mn, which represents a YoY decline of 26%. However, even that figure is probably too high. If the above analysis on how active players are likely to peak is accurate, we should see a slowdown in replacement rates as players who were caught up in the BR craze move on to other games and formats. These players are then less likely to buy new headsets as it is non-essential for other forms of gameplay. Also, note that a large number of existing headset owners made the purchase last year, which pushes out the distribution of the replacement cycle. That is to say, this large group of new headset owners that purchased Turtle Beach headsets for the first time in 2018 are unlikely to purchase a new headset in 2019, given that the average replacement period for Turtle Beach headsets is 24 months. This implies that management's assumption that 50% of incremental users acquired during 2018 will replace their headsets in FY19 may be too optimistic, even if we assume that the active player base for BR games remains stable. Moreover, I would argue that projected FY19 cash flow needs to be significantly discounted since it is based heavily on this replacement rate assumption. Management has admitted that there is a very wide distribution around this 24-month average period, which suggests that next year's cash flow based on their guidance is highly uncertain. The implication of this analysis is that valuation multiples should be adjusted lower to account for this uncertainty (will return to this later). Overall, I think the evidence points to three conclusions regarding growth: first, that it is an isolated episode driven by the BR craze and hence does not constitute a secular trend; second, that it is unlikely to be sustained as popularity of the BR genre peaks and player preferences move on to newer games and genres; third, future growth will likely trend in-line with console installed base growth, game release cycles and inventory levels, which are likely to revert to the stagnant trend we observed pre-FY18. 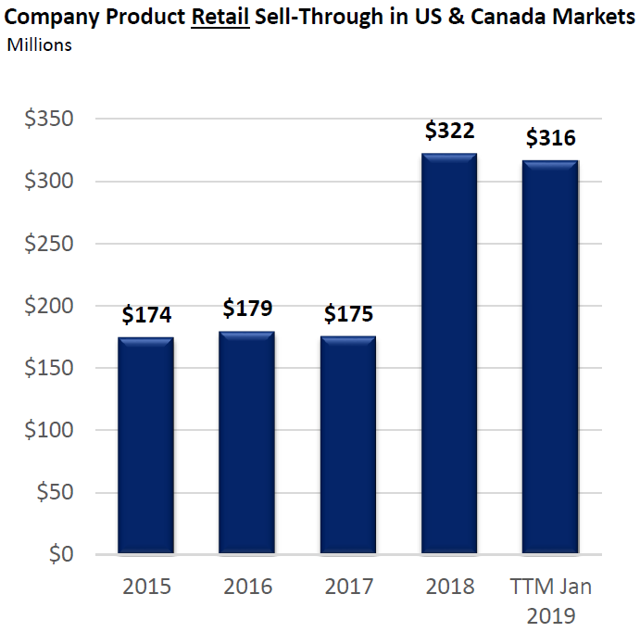 HEAR's position in the North American console headset market is dominant - the company generally retains over 40% market share and captures proportionally more incremental share as the market expands, as seen below when it grew to 46.1% in FY18 from 42.4% in FY17. The UK is their second-largest market for console headsets, and channel checks show that they have significant shelf space among large retailers, offering the full range of headsets with MSRPs ranging from sub-$50 to over $300. However, their position in PC headsets is far weaker, with much more competition from both gaming peripheral brands and multi-purpose headset brands (Bose, Audio-Technica, Sennheiser and others). In contrast to the Turtle Beach brand, their Atlas line of PC gaming headsets have low visibility in retail stores and online, with poor brand recognition compared to more established brands like Logitech, Razer, Kingston, and other cornerstone PC peripherals brands. Crucially, their purchase of ROCCAT seems to be a move in a very expensive direction, with a large increase in costs stemming from promotional allowances, OpEx, marketing and incremental investments. Crucially, note that the competitiveness of this market means any payoff from this upfront spending is likely to be marginal, with the brand requiring a long time to build up the recognition that its larger rivals already possess. Management is targeting $30mn in ROCCAT revenues by 2020, which would make it accretive to EPS (currently operating at net-income loss), but that seems too optimistic given the competitiveness of their markets. Even if this materializes, $19.2mn (including earn-outs) is an awfully high price to pay for a small gaming peripherals brand making losses with limited brand recognition in a crowded competitive space. Moreover, the low barriers to entry for gaming peripherals means the market is already fairly saturated, with a deluge of choice with very minor differentiation between each brand's products. This means power largely rests with online and retail distributors, which are able to put products in front of eyeballs and generate sales. However, management mentions in a footnote to the presentation slides that ROCCAT's structure currently is "highly integrated with distributor/owner", but that they are only buying the brand as a "stand-alone", which creates the risk that they will be de-prioritized by their current distribution partner once the corporate structure is de-coupled. In that case, HEAR has to source for distributor partners themselves and convince them to carry ROCCAT as a key brand partner - a process that takes tremendous time and financial incentives. Management commented that they could leverage off HEAR's brand recognition to sell more PC headsets, but the distinctness of both brands makes it hard for any meaningful association to be made in consumers' minds. Moreover, ROCCAT's presence is largely in Germany, the Nordics and Asia, which is very far away from HEAR's strongest markets. What Does The New Normal Look Like? In projecting future financial results, we can gather clues from HEAR's performance pre-FY18 to see what "normalized" margins are likely to be if our thesis plays out. Seen above, I strip out the effects of impairments, restructuring, and the effects of excess inventory and increased obsolescence due to the impact of old-gen headsets from 2013 to 2016. Also, the adjusted gross profit margin for FY17 is slightly higher than normal due to incidental logistical cost savings. I've left out expenses below the operating line to account for an improved balance sheet and to exclude the mark-to-market impact of their warrants. Erring slightly on the more optimistic side, normalized gross profit margins seem to hover around 29% - 33%, with adjusted gross margin in the low single digits. This trend held until FY2018, when margins increased exponentially due to the BR craze. This suggests that normalized profitability is very low, absent any exogenous positive shock. The low returns are consistent with the saturated and competitive nature of the console/PC headset market, particularly since larger players have an advantage over smaller players like HEAR due to economies of scale/scope. Larger players like Logitech, Razer, Corsair and Steelseries have a much broader range of products with existing brand recognition. This means their advertising/marketing costs per unit of sales is far lower since the benefits of brand advertising can be diffused over a wide range of peripherals as costs are spread out. Moreover, they have far higher bargaining power relative to distributors due to stronger brand awareness and the ability to supply a whole suite of products. On top of this, they enjoy greater back-office cost efficiencies by virtue of their size alone. This means that although price points are similar for products of the same quality from different brands, HEAR generates comparatively lower returns due to higher costs. This is seen quite clearly when comparing Figure 4 and Figure 5, with Logitech enjoying far higher margins than HEAR over the long term. Combining these observations, I posit that HEAR generates lower-than-industry returns under normalized conditions, with gross margin between 29% - 33% and operating margin at 3% - 7%. If I reverse-engineer management's FY19 guidance, it implies FY19 operating margin at ~6.0% (assuming 10% tax rate, no interest expenses and other income/loss), which falls within this range. However, note that FY19Q1 sales are likely to be abnormally high relative due to a strong holiday season near the peak of the BR craze. Headset attach rate for consoles remain stable in the long-term, with a slight fall in FY19. ROCCAT and PC peripherals business grows in-line with the industry but does not become overwhelmingly popular; vast majority of revenue still derived from console headset sales. Revenue volatility due to inventory cycles and game release cycles are smoothed out. Total revenue for console headsets will grow in-line with the size of the console installed base (Xbox and Playstation, excluding Nintendo Switch), and inflation. Working capital requirements will grow in-line with revenue as the company requires more cash to increase inventory and receivables. We assume the cash conversion cycle remains stable from FY18 onwards. Based on these assumptions, I value HEAR with a DCF model projecting terminal revenue growth at 2.5%, and terminal FCF growth at 2% (model outputs attached at end of article). The difference between FCF and revenue growth is largely attributable to the increasing working capital required to support the business and slightly higher CapEx costs due to investments into ROCCAT. Taking these assumptions, the best-case valuation for HEAR is approximately $182mn, applying a discount rate of 10%, with terminal growth for cash flow beginning after FY2020. This would indicate that HEAR is fully valued on its fundamentals at current prices. On the bear case, I believe the company will have a significant top-line miss on the FY19 guidance, and a further drop in FY20 as attach rates could decline once the BR format fades in popularity. Tweaking assumptions to reflect this view, I assume FY19/20 revenue comes in at $230mn and $215mn respectively, with terminal growth at the same rates thereafter. This outputs a valuation of $158mn, which does not make it an attractive short, particularly with borrow costs at over 25% as of writing. HEAR's long term prospects are at best mediocre, with console headset revenue largely tied to console installed base, which is likely to remain stagnant in the long-term. Management's guidance for FY19 is likely to be over-optimistic due to the dynamics analyzed above, and top-line quarterly misses should lead to large negative sentiment. At over 13X FY19 earnings, HEAR seems particularly expensive for a gaming peripherals manufacturer that operates at a disadvantage to larger peers in the PC space. Hence, HEAR's shares are likely to be dead money in the long-term, with a high likelihood of top-line misses going forward, which could lead to short-term declines driven by negative sentiment. Moreover, their largest shareholder (SG VTB Holdings) has sold ~1.73mn shares since the start of 2019 (Figure 7),with 687,574 shares remaining for disposal. This is a concerning sign indicating decreasing insider confidence in the company, and could drive down the share price if they continue to sell down. Moreover, future disposals could also induce additional short-selling as borrow costs become cheaper, potentially amplifying the share price decline from earnings disappointments. With mediocre long-term prospects, and the risk of short-term sentiment turning negative in FY19, investors should avoid HEAR. Disclosure: I am/we are short HEAR. I wrote this article myself, and it expresses my own opinions. I am not receiving compensation for it (other than from Seeking Alpha). I have no business relationship with any company whose stock is mentioned in this article. Additional disclosure: Short call options.